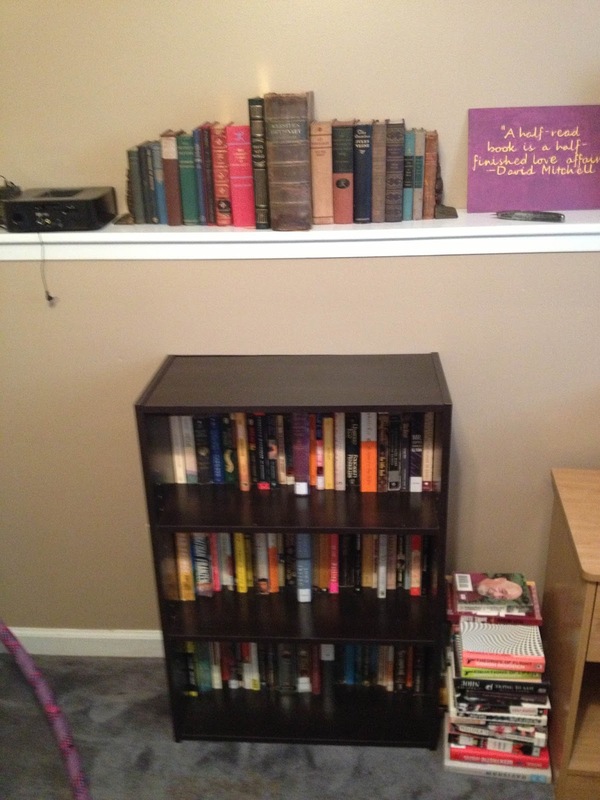 The Broke and the Bookish : Paula gets a new library! So this past month my life has been surrounded by boxes. My roommate and I got to move out of our terrible slightly sketchy apartment and into a pretty house with a backyard and all that lovely stuff. We also picked up a third roommate along the way and she is pretty fantastic as well! With all that being said- there has unfortunately been a lack of time for reading (and therefore a lack of a review for you guys... sorry!). Plus side for me is that both roommates love books as much as I do- and when we were trying to figure out exactly what to do with the downstairs den... we all glanced over at our bookshelves. And thus a group decision was made to display all of our books in one place. So far I am the only one who has had a chance to unpack all of my books. So I thought I could share my new shelves with you all. My "Read" shelf that is getting dangerously close to full. And that's even after I routinely purge it of books I don't consider my super favorites or worthy of re-reading. My "to-read" shelf. I just bought a new one since my old one collapsed from having too many books on it (Oops!) And as you can see on the floor there are already two stacks waiting to find space. 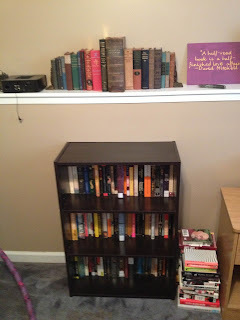 Also my new favorite part of my library- a great way to display my old book collection. 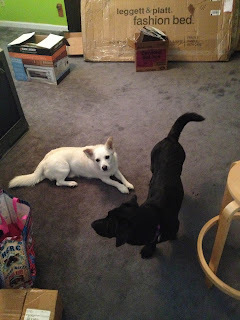 And while they aren't part of the new library... two great creatures I get to constantly spend time with. My dog Pogo (the white corgi mutt) and his new lady love Luna (my roommate's basset hound mutt). And don't worry- we are painting over that awful lime green wall. Sorry I don't have a review for you this time. Hopefully once we get all of these boxes unpacked and awful walls painted I can get back to what I truly love doing! I know what you mean about the TBR shelf *looks over shoulder at looming stacks of books* Sometimes I think they repopulate themselves when I'm not looking. 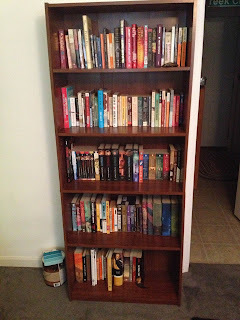 I don't like to talk about the TBR shelf or TBR collection on Kindle. Too scary. I really need to purge some books before I move (except there's so many I haven't read that I don't want to purge anything until I've read it). I love seeing how people display their books. My shelves are getting so full that I stack them on the floor too. Since I'm hoping to move out soon and get a place of my own, reading about your whole 'adventure' with changing houses gets me excited. :D As for bookshelves, I'm pretty sure that I should find a new place to stack my books since I may be faced with the same problem as you, i.e. shelves collapsing. You have a lot of book cases - THAT IS GREAT! Glad your moving forward with life! Hopefully you'll have time for more reading soon. I love the bookshelves. :) I really have to find some more room for a couple more bookshelves. My two 'to read' shelves overtaken a bookshelf in another room. I think they're planning a coup. Book purge. I did this the beginning of summer then I sort of regretted who I took the books to. Her in store credit program changed since the last time I donated. now I have $250 of credit on a card but if I want a book 1/2 is credit the other is cash. So I guess the card will just sit there sadly. Wish I let more friends go through the books and then gave it to goodwill. Love the bookshelves, and that you're creating a reading room - the stuff of dreams for book lovers! I'm curious, how are you guys differentiating between each others' books?